The Philippines has established a sound foundation for improved fisheries management. The adoption of coastal resource management (CRM) as a basic service by local government is the most recent benchmark of institutional awareness and capacity for managing marine and coastal ecosystems. The FISH Project (Fisheries for Improved Sustainable Harvest) built on this foundation and lessons learned from the Coastal Resource Management Project (CRMP) and other projects and programs to achieve the next crucial benchmark in managing fisheries and coastal resources in the Philippines. This benchmark called for integrated fisheries management driven by informed, disciplined and cooperative stakeholders at national and local levels of engagement. 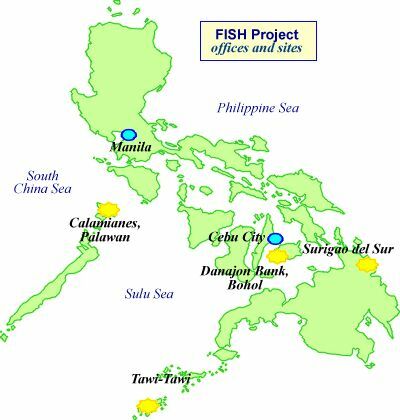 The FISH Project was a seven-year (2003-2010) technical assistance project funded by the United States Agency for International Development (USAID) and implemented in partnership with the Department of Agriculture-Bureau of Fisheries and Aquatic Resources (DA-BFAR), other national government agencies, local government units and non-governmental and other assisting organizations. Project activities focused on four target implementation areas: Calamianes Islands (Palawan), Danajon Bank (Bohol, Southern Leyte, Leyte, Cebu), Surigao del Sur and Tawi-Tawi. This is an interactive map. Click on labeled features for more details. The Project was expected to result in a 10% increase in fish stocks in the four target implementation areas by 2010 (Click here to download the Project's completion report to its partners). To achieve this, national and local activities were undertaken to build capacity, improve the national policy framework, and develop an informed constituency for fisheries management.